Morning/evening prayer: Pray the first thing you wake up in the morning, and just before going to sleep at night. Work and prayer: The work you do can be a kind of prayer, if you do your work with good moral values–not if you are cheating others, stealing from your boss, etc. Quality time with God: Although your work is a kind of prayer, don’t neglect to have certain fixed times to just pray. 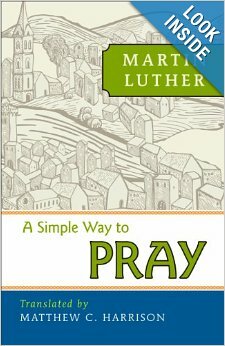 Remember, Luther wrote this book not for monks, but to encourage his barber to pray. There are many ways to pray: Sing, recite written prayers, use your own words, meditate on the Lord’s Prayer, and many other ways… The point is to use whatever way of praying helps you to put your mind (attention) and heart (genuine love for God) into the quality time you spend with God. Be yourself before God. Although Luther is giving examples in this letter about how to pray, he reminds people that his own prayers are different on different days. He encourages the use of your own words and feelings with God–you can be honest with God, no matter what the situation. Listen to the Holy Spirit. Luther says sometimes when you are praying using his method, the Holy Spirit will grant you a BETTER insight or blessed way of being with God in the moment. When this happens, let go of your prayer “method,” and allow the Spirit to guide your prayer (that is, prayer methods are not laws to obey). Having trouble praying? Luther writes that sometimes he feels he’s becoming too cold, apathetic, or distracted in his prayer life. When this happens, he sneaks away by himself into a quiet room with the book of Psalms–or sometimes goes to church to pray with others. 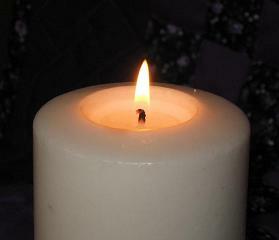 Prayer is about kindling a little flame in your heart. Don’t try to do everything at once. “A good prayer should not be long, nor should it be drawn out, but prayed often and fervently. Don’t worry about covering a lot of ground. It is sufficient if you really dig deep on one idea and pray about it, so that you can “kindle a flame in your heart” — this “flame” is given by the Holy Spirit, who will continue to teach and guide us, in ways we could not plan ourselves. * Edition used for this article: “A Simple Way to Pray” by Martin Luther, translated by Matthew C. Harrison (Concordia Publishing House, 2012). **If Martin Luther were alive today, I imagine he would suggest people use short bible passages to practice this same type of meditative prayer–the bibles found on their coffee tables and in their cell phones.